How many times have I told you that I am glad that I took to documenting outdoor adventures via the modern equivalent of a journal? At least a couple, and I mean it. How fun is it to look back in time and get another smile, chuckle or head shake out of some details that are long gone from the memory? Sure the big fish or weird catch sticks with you but it’s all the little details that really make the writing worthwhile. Throw in the photo album and some video these days and you’ve got a winning combination. 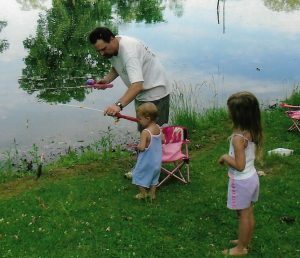 For example, the words and pics for today’s flashback come courtesy of the original report submitted to family and friends back on June 10, 2003. 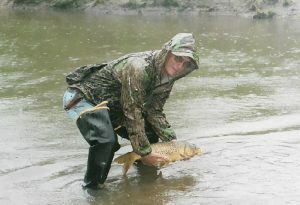 Weather – Despite the weatherman predicting rain, we went fishing, spending around four hours in the creek. Part of the time it rained, the rest of the time it rained harder. Tips – Wait to see if anyone is injured before laughing. I’ve learned this one over the years and was able to chuckle after Dad slid down the bank into the creek. Boots – Smart enough to check for a matching pair. Not smart enough to check for holes. With a knee-high hole in one of my hipboots, I might as well have worn sandals. 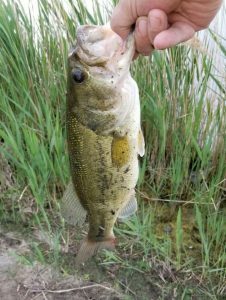 Bites – Numerous fish with a handful of hookups, but the rain limits mosquitoes and biting flies. 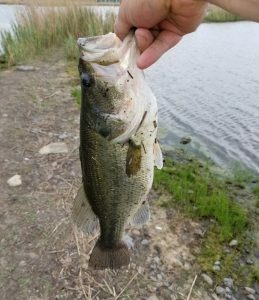 I got to wondering the other day in my “Am I a Bad Fisherman?” posting about my merit as a dedicated fisherman after choosing some much needed rest over an early morning of fishing. Well, I tried to make up for it a couple days later and wound up questioning myself yet again. 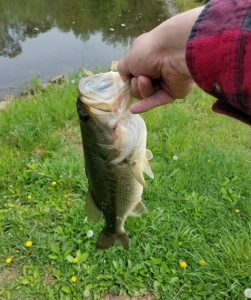 A couple tentative titles for today’s report were “Am I an Old Fisherman” and “Am I a Wimpy Fisherman” but I went with the standard fishing report format of location and date instead. Details below on why the alternative titles were up for consideration. Late Night – My first error in judgment involved staying up too late and having a few cold ones when my intent was to get up at 4:45am. In the end, that poor decision making resulted in about 4.5 hours of sleep so was kind of getting off on the wrong foot from the get go. Heat – The weather app on my phone read 73F at 6:35am as I made my first cast but it was already a hot 73 degrees. No air moving whatsoever and the effort of dragging my boat out of the back of the truck over some parking posts in a slightly elevated parking lot got the sweat flowing. Then, I had to drag the boat and gear through about 20 yards of weeds which got the heart pumping and the sweat kicked up a notch. And after that I just had roughly 400 acres of water in front of me to choose from armed with an old set of oars and an even older rower providing the power. 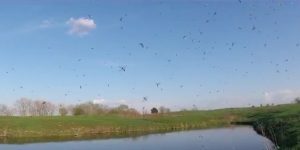 Gnats Are Gnuts – If you have been enjoying the outdoors in my neck of the woods as of late, I am certain you are aware of the prevalence of gnats, a real bumper crop. Under the bill of my hat, on the inside of my fishing shades, in my ears, up my nose and yes, I ate a couple, just relentless. 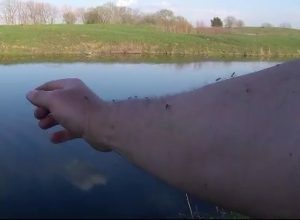 Most times you can get away from the bank and enjoy a bit of an escape but these pests were thick everywhere, flat out crazy and no fun. 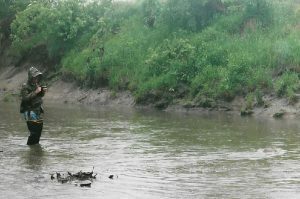 Weeds – I am accustomed to goofy, scattered weeds on this fishing hole and I hope that someday they may subside as the lake ages. No go as of yet, however, as the vegetation influenced my presentation as I went pretty much all in on a buzzbait in open water amidst the gunk. 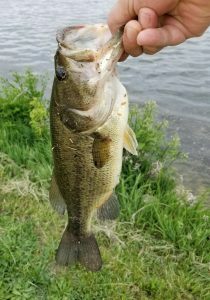 Also tried a topwater frog in spots and flipped a Senko around but only the buzzer was a winner in the calm, sunny conditions that were likely better suited for something else. A gamble I was willing to take in hopes of a big bite but didn’t materialize this time around. 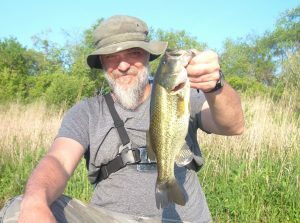 Quitting Time – By about 8:30am, the factors above had taken their toll and I headed back to my launch point to see if I could rustle up a last bite from a patch of flooded bushes and sunken culverts. No luck in 15 minutes or so and I’d come to the conclusion that my mind and body had had enough of our early arrival of summer. But before I could get off the water, an Iowa DNR truck pulled up nearby and I rowed over for a license check (legal as I should be with my internet purchase the night before). A nice fellow and he also provided a recommendation on gnat repellent though I have since forgotten what it was and only recall that he said it comes in a “green bottle.” Oh well, I don’t think anything works anyway. 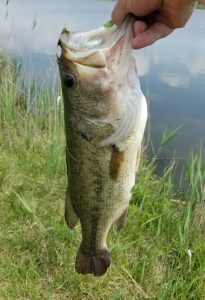 More bass as our brief visit to spring has rapidly turned to summer with Mother Nature turning up the heat. 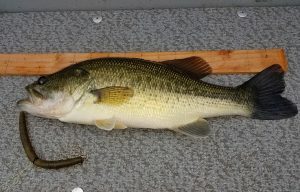 Angler Comments: Lots of action from shoreline bass. Most are 10 – 14 inches. 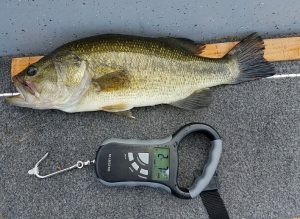 It is hard to find a bass more than 15 inches. 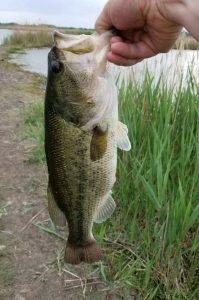 All fish have been caught on Wacky Worms. 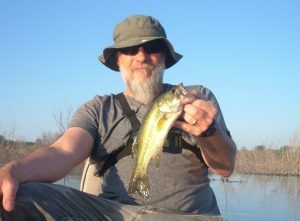 We interrupt our regularly scheduled Top 5 Update (will appear tomorrow) to wish one of my co-anglers a Happy Birthday. 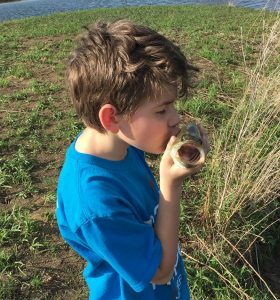 Today marks birthday number 9 for our oldest boy, Jayce, and as always I can come up with an outdoor tale to pass along. In this case, I got a little help on what to post courtesy of a birthday gift that Jayce received from his Uncle Brent during a family celebration yesterday. 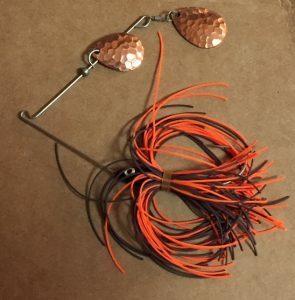 The spinnerbait pictured above is the latest version of something that I dubbed “The Emiquon Special” after watching Brent wield it en route to a 98 bass day on his first ever visit to The Emiquon Preserve back on October 7, 2009. 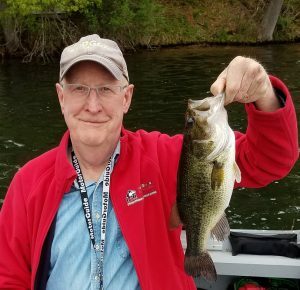 While not all 98 of his bass fell to this legendary bait, it caught the vast majority and his final flourish in pursuit of the century mark had me setting down my rod and reel to simply watch the spectacle. 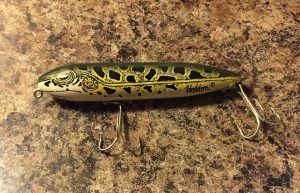 Anyway, there’s actually a little more to the story as Brent’s use of this spinnerbait color scheme goes back to the mid-80s and over 30 years later he’ still fooling them on the latest version of the bait, pics and tales for another day. Don’t know if Jayce realizes exactly what he’s got a hold of with this piece of family fishing history which was handcrafted by his Uncle Brent, the angler who made it famous. Pretty cool and will be fun to watch when we put the new weapon in his arsenal to use. 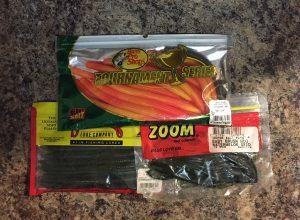 Spinnerbaits have a little bit more of a learning curve than the baits Jayce has already put to work primarily in the aspect that you generally need to get the bait moving shortly after it hits the water. 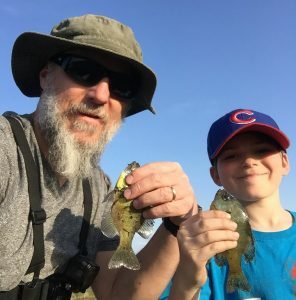 Simply another skill for our young angler to work on and once he gets the hang of it I suspect the Emiquon Special and the bass will take care of the rest. So, while Jayce and I wait for a chance to get on the water together for some practice, I told him that I’d just keep the lure nice and safe in my tacklebox. For you see, Uncle Brent has never made one of these for his older brother. 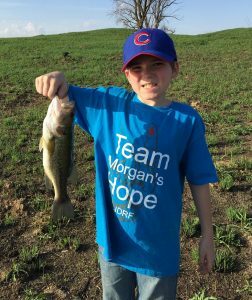 Happy Birthday to my fishing buddy Jayce. I had a shot at getting in a few hours on the water this morning and guess what I did? Yep, I slept in, instead. Turned out that conditions looked halfway decent though during one of the regular times I woke up. Around 6:00am there were overcast skies and a slight breeze on the heels of what looked to have been some showers. Now, as I put this post together, the sun has come on full force and the breeze has picked up with temperatures rising into the low 70s. Overall, a darn good morning to fish. Nothing to do with skill set and bad habits, this question revolves solely around dedication. 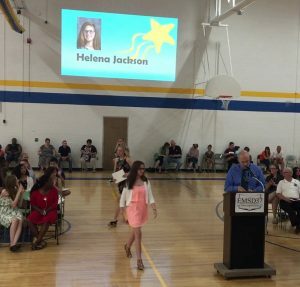 Yesterday was just another of our crazy May days with the mind and body on full throttle from 6:00am until 10:00pm with a full slate of work and family activity. As a result, I had nothing prepared for an anticipated sunrise first cast and frankly, I was just plain wore out. Now, May is among the lengthiest months at 31 days so there should be ample time to fit everything in right? Well, here’s my list of excuses leading up to fatigue winning over fishing with a list of all of our May commitments below (probably even forgot to include a few). 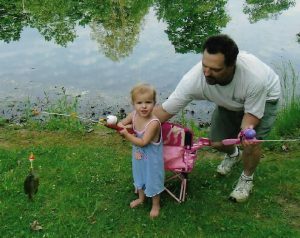 Interspersed through today’s post I have included the reasons why it is okay to be a “bad” fisherman when it comes to skipping out on an opportunity. Better to invest your time in doing your best to be a good spouse, parent, family member, friend, employee and so on. 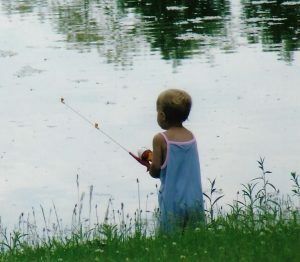 I dig fishing and would love to do it anytime I could. Well, except for this morning and the rest of those items above result in being just flat out wore out come Friday night/Saturday morning. Oh yeah, I nearly forgot that there was also a Grandparents Day for the boys at school with my folks. 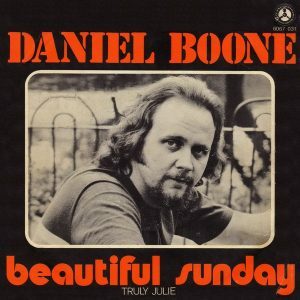 Of course, I didn’t have to worry about anything associated with that gig but got me to thinking that I should ask my parents, “Why didn’t you warn me about what lie on the horizon?” Actually, they did, by example, you just roll with taking care of everybody. I was just too busy with my own activities to comprehend that their world also revolved around a total of four kids. Funny how this has all turned out. 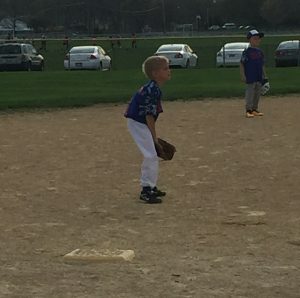 May 1 – Silvis Cub, Zac (3B), reminiscent of Kris Bryant, Ron Santo or perhaps a Knox College Siwash fellow who manned the “hot corner” in the 80s. Today’s update marks six straight weeks with submissions. 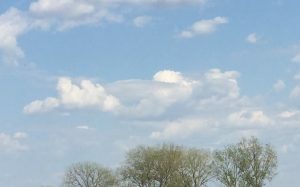 The hits keep coming from West Central Illinois as we head into the last month of spring. And, as these entries demonstrate, if you ain’t fishing wacky, you are missing out. 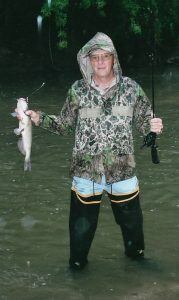 Angler Comments: Lame excuse for not doing better – too late a start, overcast at first, followed by bright sun. 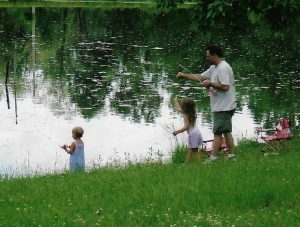 Always fun to reminisce about fishing holes from the past and Ponder’s Pond was a winner. Nicknamed “The Ponderosa” and located north of Knoxville, Illinois, it was a regular stop for a group of fishing buddies back in the late 80’s. 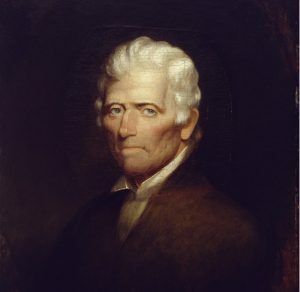 The friend who gained us access and clued us in to the pond’s nickname was generally referred to by a nickname or two himself. 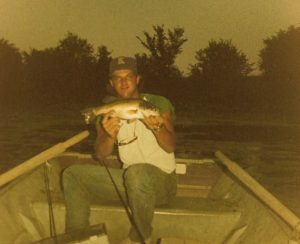 “Hack” or “Hacksaw” grew up in Knoxville and had connections with the family who owned the farm pond and the Ponder’s were kind enough to let some college boys test their waters. That buddy’s given name is Matt Reynolds but we still refer to him as “Hack.” In fact, I just did so last weekend when getting to visit for the first time in a few years. But the nicknames don’t stop there as we also made a few casts at the location with a batch of anglers also known as “Geek”, “Swerve” and “Catfish/Catdaddy.” In real life these guys are actually named Mark Junk, Mick Swanson and Jim Hunter (fitting nickname for that fella, huh?). And the weapon of choice on today’s featured outing, designated in the log entry above as Zara Spook (frog) was affectionately nicknamed “The Pickle.” Well, “The Pickle” knocked ‘em pretty good on this day with three of the four bass coming in from 17-20.5” and weighing 2-2, 2-13 and 3-12. While partaking of more than a few of the bar’s beverages, typically “The Beast” or some “Beast Light”, we’d usually cross paths with some of the regulars that “Hack” knew, including “Fast Eddie” and “Two Speed.” And when another buddy, John Junk, was along for the adventure one of the bartenders would simply refer to him as “The Big Guy.” Of course, there was also “The Little Guy”, yours truly (aka “TJ”), who still is considerably shorter than John. You know, I could probably write all day about the five hour trip I enjoyed with my boy, Jayce, back on Cinco de Mayo. Stats, pics and video of his catches have already graced the blog and the Troy Jackson Outdoors Facebook page. But those items only tell part of the story as a fishing trip is always about more than the fish. 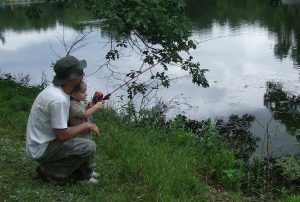 Cloudy Imagination – As we made the ten minute stroll to the fishing hole, Jayce said, “Hey, Dad check out that cloud!” Well, there were plenty of scattered clouds so I told him that I wasn’t quite sure exactly where to look. So, he points and adds “that one over there that looks like a penguin with Mickey Mouse gloves and a mustache.” Oh, that one. Pretty obvious to one of us at least and I’ll leave it to you to let your imagination do its thing with the actual shot above. Jimmy Who? – Jayce doesn’t have the slightest idea who Jimmy Houston is and for anyone else out there who is not familiar here’s a brief bio. Houston is a bass fishing legend and Fishing Hall of Famer who had a successful career as a tournament angler and parlayed that success into a long running outdoor television program. An entertaining and enthusiastic fellow, one of his trademarks was kissing bass. So, when Jayce pulled this stunt on our trip I had to laugh and applaud his appreciation of the catch. I think I’ll stick to a pic and standard release, however. Gnats and Worms and Jayce, Oh My! 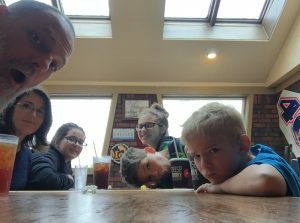 – The video above demonstrates that Jayce still had plenty left in the tank for the three quarter mile walk back to the truck at the end of our day. His gyrations did have a purpose beyond being goofy as the gnats had gotten out of control. 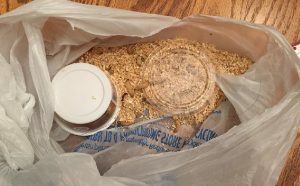 The bag he is wielding contained our bait (waxworms) so those larvae that eluded being fed to a fish sure wound up with a wild ride as evidenced by the pic below. 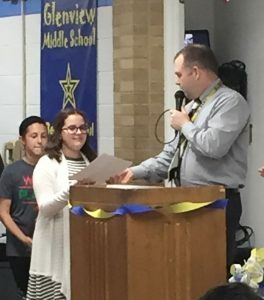 Favorite Quote – Although there were plenty of choices for this one, I’d have to say that, “Dad, I like your laugh” was the best of the bunch. It’s always interesting to relive an adventure via GoPro or iPhone video after returning home and it still kind of strikes me as a bit goofy when hearing/seeing yourself on audio/video. 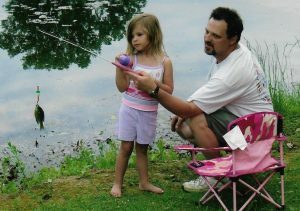 Completely unscripted, unlike the big boys in the world of media content creation, just a guy and his kid going fishing. So when your kid comments on the way you express your enjoyment of a shared adventure it’s priceless. I suppose someday, more than a few years from now, he will come to appreciate all that lies underneath that involuntary reaction to some quality father-son time.